The Value Line index is the one major equity index that doesn't look so much like a big picture counter-trend rally correcting a previous first wave down. Instead, it looks like a massive double top. 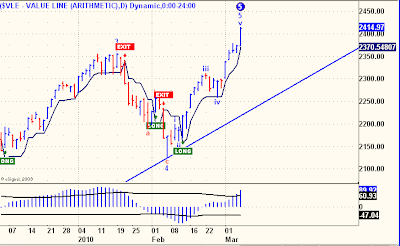 Do I really expect to catch the exact top of a massive three-year-in-the-making double top in the Value Line Index with my self-crafted tools and indicators? Ok Allan, I am usually very supportive of your analysis but this time I need to cry foul. I find it very interesting that you chose to cut the first (monthly) chart off at the beginning of 2003. If you showed a few more years in the history the bottom that you just about show in 2003 has a chart pattern that looks very similar to the bottom and massive double top you are calling out in the recent price action. 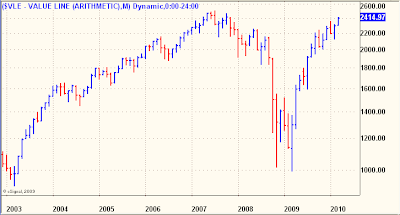 The bottom in 2003 would have had you calling a massive double top at 1310. 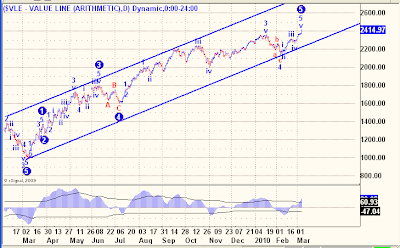 Instead of double topping at 1310 the index continued a climb to almost 2600. 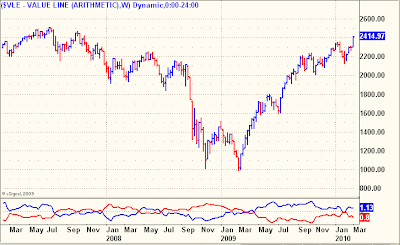 Would you been making the same massive double top call in 2003? Although it is possible to crop charts to emphasize a point, this time all I did was use the default view form eSignal, so whatever evil or manipulative intent you are accusing, just wasn't there, at least this time. As is so often the case in my charts, they speak for themselves and my words as often diminish their focus, as enhance it. Fair enough. I can accept that explanation "at least this time". I find it useful to not pass judgment on a chart thesis until I zoom waaay out. It took me a long time to start doing that. I used to laugh at one of my friends who would always bring up a 10 year chart when we were discussing the daily. In this case as always the charts will speak for themselves. If you included more data in your chart would you still be calling it a massive double top? If we blow through and continue to move up I'm sure the detractors on this board will enjoy exploiting that call. 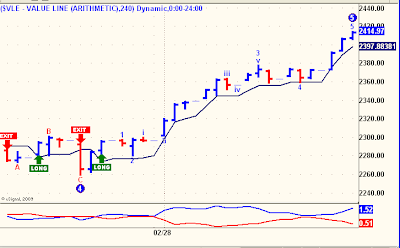 Me...I will follow the market at take what it gives me, double top, failed breakout, new highs. The market will do what it does best..continue to humble us all. In the end, it comes down to whether we make money or not. Enjoy and apologies for portraying the chart as more sinister than it was. Allan said: "As is so often the case in my charts, they speak for themselves"
. . . that's why a bear can rest at ease . . .